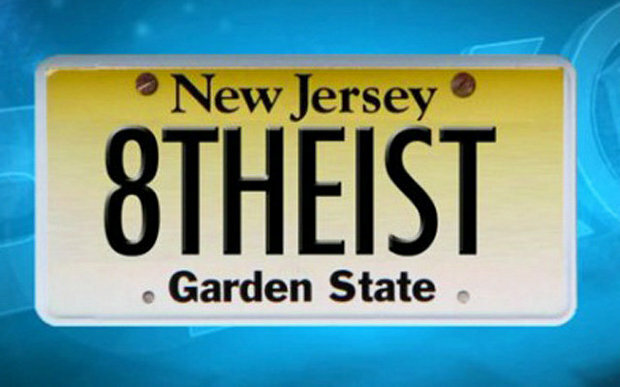 Two years ago Shannon Morgan of New Jersey ordered a vanity license plate that read 8THEIST. State officials denied her order, explaining that it might be considered offensive. She sued and won. The state Motor Vehicle Commission will also have to pay Morgan $75,000 to resolve her claim. They don't give a damn, because it's taxpayer money that they'll use to pay for their foolishness. Everyone in the chain of command who rejected the license plate request should be fired and barred from working for the government ever again, and forced to wear a colander on their head for the term of their natural lives, if you ask me. Bonus: as a result of the lawsuit, the DMV must also issue the following vanity plates or "combinations that are substantially similar": SECULAR, RATIONL, HUMANST, ATHEISM, GODLESS, HEATHEN, HERETIC, SKEPTIC, BLASFMR, REASON, EVOLVE, TRANS, LGBTR.TS, LGBTQ, PRIDE, QUEER, GAYPOWR, LGBTALY, FEMINISM, FEMINST, EQUALITY and 4WOMEN.